Aqueous humour drainage in eye. Artwork showing the drainage (arrows) of the eye's aqueous humour through an opening called Schlemm's canal. This canal is located at the sclerocorneal junction between the sclera (white of the eye) and the cornea (the bulge at the front of the eye). Arrows show how aqueous humour drains through the canal and then into a duct draining to the venous system. 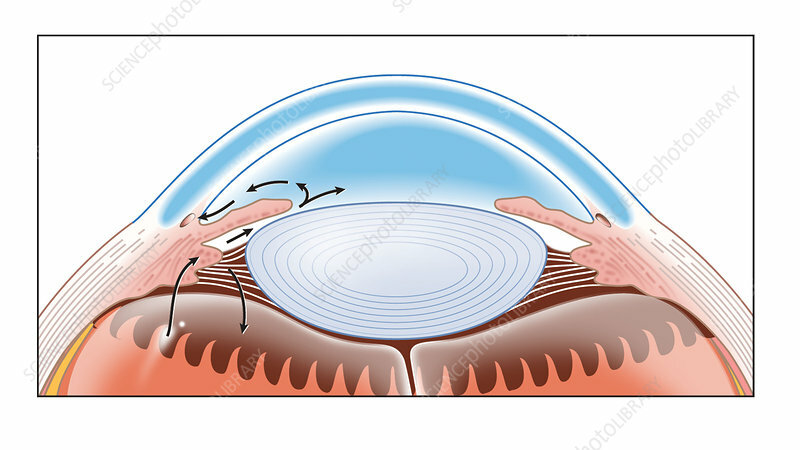 The oval shape at centre, behind the cornea, is the lens. If Schlemm's canal gets blocked, pressure can build up inside the eye and lead to blindness.